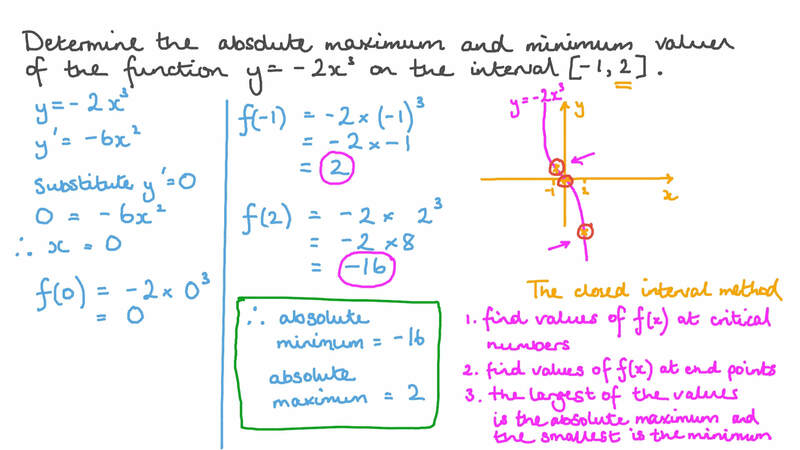 In this lesson, we will learn how to find the absolute maximum and minimum. Determine the absolute maximum and minimum values of the function 𝑦 = − 2 𝑥 3 on the interval [ − 1 , 2 ] . AThe absolute maximum is 2, and the absolute minimum is − 1 6 . BThe absolute maximum is 12, and the absolute minimum is − 2 4 . CThe absolute maximum is 6, and the absolute minimum is − 3 2 . DThe absolute maximum is 128, and the absolute minimum is − 1 2 8 . Determine the absolute maximum and minimum values of the function 𝑦 = 2 𝑥 + 𝑥 − 3 𝑥 − 2 3 2 , in the interval [ − 1 , 1 ] , approximated to two decimal places. Find the absolute maximum and minimum values of the function 𝑦 = 𝑥 4 + 1 𝑥 − 4 on the interval [ 1 , 3 ] . AThe absolute maximum is 0, and the absolute minimum is − 1 4 . BThe absolute maximum is 5 3 6 , and the absolute minimum is − 3 4 . CThe absolute maximum is 2, and the absolute minimum is − 3 4 . DThe absolute maximum is 0, and the absolute minimum is − 1 4 . Determine the absolute maximum and minimum values of the function 𝑓 ( 𝑥 ) = 2 𝑥 − 8 𝑥 − 1 3 4 2 in the interval [ − 1 , 2 ] . A The absolute maximum value is − 1 3 , and the absolute minimum value is − 2 1 . C The absolute maximum value is − 2 1 , and the absolute minimum value is − 1 3 . D The absolute maximum value is − 1 6 , and the absolute minimum value is 48. E The absolute maximum value is 32, and the absolute minimum value is 0. Determine the absolute maximum and minimum values of the function 𝑦 = 𝑥 2 𝑥 + 8 on the interval [ 2 , 6 ] . A The absolute maximum equals 3 1 0 , and the absolute minimum equals 1 6 . B The absolute maximum equals 1 1 8 , and the absolute minimum equals 1 5 0 . C The absolute maximum equals 3 1 0 , and the absolute minimum equals 1 4 . D The absolute maximum equals 1 4 , and the absolute minimum equals 1 6 . Find, if any, the local maximum and local minimum values of 𝑓 ( 𝑥 ) = 5 𝑥 1 3 ( 𝑥 + 1 ) 2 , together with their type. Find, if they exist, the values of the absolute maximum and/or minimum points for the function 𝑓 ( 𝑥 ) = √ 3 𝑥 + 1 0 where 𝑥 ∈ [ − 2 , 5 ] . AThe function has an absolute minimum value of 2 and an absolute maximum value of 5 . BThe function has an absolute maximum value of 5 . CThe function has an absolute maximum value of 2 and an absolute minimum value of 5 . DThe function has an absolute minimum value of 2 . EThe function has no absolute maximum or minimum points. A The absolute maximum value is 64 at 𝑥 = − 1 , and the absolute minimum value is 4 at 𝑥 = 5 . B The function has no absolute maximum or minimum values. C The absolute maximum value is 25 at 𝑥 = − 3 , and the absolute minimum value is 4 at 𝑥 = 5 . D The absolute maximum value is 64 at 𝑥 = − 3 , and the absolute minimum value is 25 at 𝑥 = − 1 . E The absolute maximum value is 64 at 𝑥 = − 1 , and the absolute minimum value is 25 at 𝑥 = − 3 . In the interval [ − 1 , 2 ] , determine the absolute maximum and minimum values of the function and round them to the nearest hundredth. AThe absolute maximun is 7.00, and the absolute minimum is − 7 . 5 6 . BThe absolute maximum is 11.00, and the absolute minimum is − 4 . 1 3 . CThe absolute maximum is − 7 . 5 6 , and the absolute minimum is − 8 . 0 0 . DThe absolute maximum is 11.00, and the absolute minimum is 6.00. 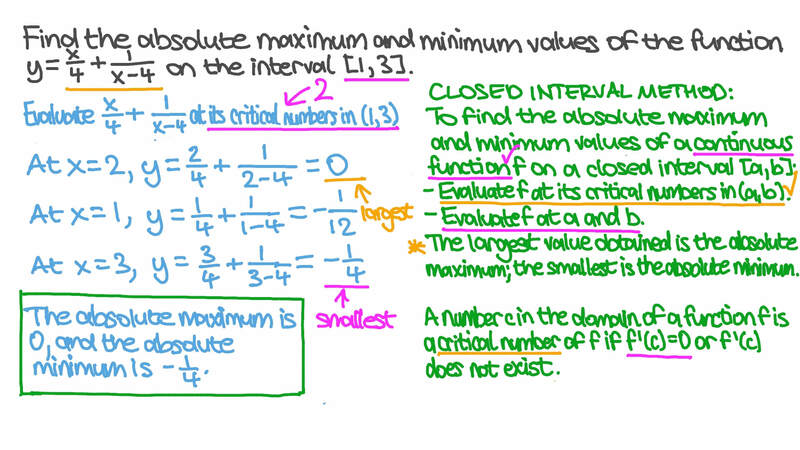 Determine the absolute maximum and minimum values of the function in the interval [ 1 , 6 ] . AThe absolute maximum is 81, and the absolute minimum is − 5 2 . BThe absolute maximum is 52, and the absolute minimum is − 9 . CThe absolute maximum is 54, and the absolute minimum is 18. DThe absolute maximum is 52, and the absolute minimum is 0. The concentration 𝐶 of a drug in a patient’s bloodstream 𝑡 hours after administration is 𝐶 ( 𝑡 ) = 1 0 0 𝑡 2 𝑡 + 7 5 2 . After about how many hours would the drug’s concentration be at its highest? If necessary, round your answer to two decimal places. Find the absolute maximum and minimum values rounded to two decimal places of the function 𝑓 ( 𝑥 ) = 5 𝑥 𝑒 − 𝑥 , 𝑥 ∈ [ 0 , 4 ] . AThe absolute maximum is 1.84, and the absolute minimum is 0. BThe absolute maximum is 1.84, and the absolute minimum is − 1 3 . 5 9 . CThe absolute maximum is 0, and the absolute minimum is 1.84. DThe absolute maximum is − 1 3 . 5 9 , and the absolute minimum is 0. EThe absolute maximum is 0, and the absolute minimum is − 1 3 . 5 9 . If a continuous function on an interval is bounded below but does not achieve a minimum, what can we conclude? AThe interval is not closed. BThe interval is not closed and it is not bounded. CThe interval is not bounded. DThe interval is the entire number line. EEither the interval is not closed or it is not bounded.